Visiting South Yorkshire or the cities of Sheffield and Rotherham then why not stay in a comfortable home from home B&B. We are only 2 minutes from the M1 Junction 31 and perfect for those Business, Pleasure and Family visits. Rother Valley Country Park is just down the road and only minutes away either by car or even walking. Visit Sheffield South Yorkshire and the surrounding villages and stay in bed and breakfast, hotel or holiday apartment accommodation provided by BedPosts members. Sheffield is a prosperous industrial city now celebrated throughout the world for cutlery. It was made here in Chaucer's day. In 1720 a Lincolnshire clockmaker, Benjamin Huntsman, started a series of experiments that resulted in the discovery of crucible steel, on which the present industry's reputation was founded. The cruciform church of St Peter and St Paul, dating from the 14th century, became the cathedral of the bishopric founded in 1913. The Graves Art Gallery has a fine collection of pictures, including Constables, Cotmans and Turners. The city is within easy reach of wonderful moorland country and the Derbyshire Peak District. 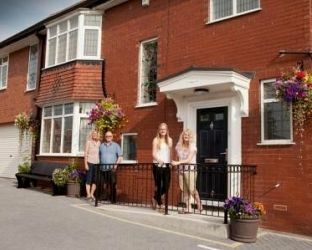 If you seek accommodation near Sheffield in South Yorkshire you have come to the website of a “club” of providers who offer affordable quality accommodation around UK in hotels, bed and breakfasts, guesthouses, inns, and restaurants plus self-catering cottages and apartments .